A section of racetrack which had not seen action since 1940 has been restored to how it looked when the circuit was in its heyday. The world's first purpose-built motor-racing circuit opened at Brooklands, in Surrey, 110 years ago on 17 June. 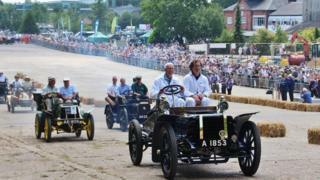 The Earl of March officially re-opened the finishing straight, which was followed by a parade of historic cars. It had been covered by an aircraft hangar since 1940, which was removed, restored and relocated on the site. The project was carried out with the help of a £4.7m Heritage Lottery Fund grant, a £1m government grant and funds raised by supporters and donors. The Grade II-listed Wellington Hangar was used for the assembly of Wellington bombers in the 1940s, and later for other industrial purposes. It is due to be opened in October as the Brooklands Aircraft Factory, housing rare and early aviation displays and telling the story of 80 years of aircraft testing, manufacture and flying at Brooklands.